My exploration on the internet (what would we do with google?) took me to Costa Rica. As I mentioned in my previous post I had to restrict myself to ingredients that are available in Mombasa. What caught my eyes was an interesting breakfast dish that most Costa Ricans have and that is Gallo Pinto. It translates as ‘spotted rooster’. The mixture of cooked rice and cooked beans together gives the impression of a spotted rooster. It is believed that there is no one version that all the Costa Ricans enjoy. They all have their versions of the breakfast dish. all you need for this dish as the core ingredients are old cooked rice or leftover rice and some cooked beans. When I say cooked beans it means beans that are soaked and cooked and not out of a can. However for a quick version I guess you can use canned beans. Some even enjoy this preparation for lunch or dinner. This concoction is not boring as you may think. The special sauce that they use is called Salsa Lizano. No, no I didn’t get that exotic sauce here, but after checking out several recipes, they recommended using Worcestershire sauce instead. Salsa Lizano is a sauce made from water, some vegetables (onions,carrots, cauliflower, cucumber etc), peppers, spices, mustard and turmeric. I was tempted to make the homemade version but that meant I would have to re stock the fridge with veggies and I didn’t want to do that as I was in the process of travelling. So for now the Worcestershire sauce will have to do. This speckled rice is usually served with either fried or scrambled eggs. The condiments served with this rice range from Salsa Linzano to chilera, guacamole, white cheese or sour cream. When it is hot add the onions and pepper and stir fry till they are half done. Add the red chillis and the sauce. Mix well. Add rice and beans and mix well. Let it become a bit hot. Add salt,pepper, cumin powder and coriander and mix it all up very well. Spoon out the rice into serving plates. Put the fried or scrambled eggs either on top of the rice or on the side and serve with salsa lizano, guacamole, sour cream or white cheese. I added chopped tomato instead of sweet pepper. When you add the sauce don’t let it dry up. It should help to moisten the rice and beans. I added a bit of salt when I cooked the rice and the beans. Add salt according to your taste. You may take equal parts of rice and beans if you prefer. 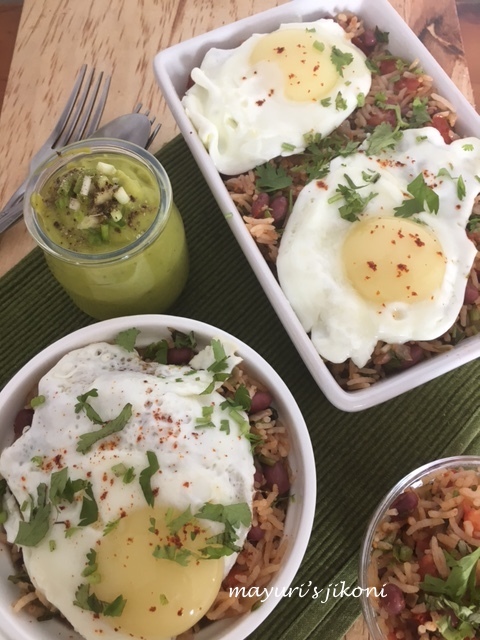 The Gallo Pinto is like a complete meal ! Looks really nice . I made it for one of the BM's but could not put a real sunny side up , so made an artificial one ! Gallo pinto looks absolutely nutritious and wholesome. Excellent meal. Very nice read and your dish looks very inviting!…must say you have taken so much efforts to prepare this elaborate meal! That's one filling breakfast. Awesome pick. Wow that is an awesome dish. It will do as lunch or dinner at my place. What an amazing Costa Rican breakfast spread that is. Looks soo delicious. It looks delicious! I am a big fan of everything with a fried egg on top! This doesn't look boring in the least bit! In fact, it looks super tasty. Even the egg on top looks tasty and perfect! Great recipe! I have eaten Gallo Pinto with fried egg for breakfast IN Costa Rica, and I can testify: it is definitely NOT boring. It's as stick-to-your-ribs a breakfast as you can get. I can't wait to try your version! Delicious recipe.. I love Mexican food. bookmarking this one.